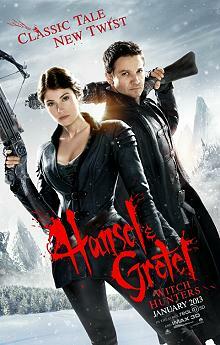 Hansel and Gretel are young adults in this filmic sequel to the classic fairy tale. They have taken their dislike of witches on the road becoming witch hunters. If this sounds predictable, it is. We have two attractive leads who are going to indulge in contemporary fights with witches with modern special effects makeup. They are heroes who are misunderstood, they save the beautiful, but innocent maid from being slaughtered as a witch (lucky for Hansel), they come afoul of a village sheriff, and they must solve the puzzle of the local missing children. Why is it that Hansel and Gretel are protected against witches? What is the secret of their past? What will be their fate?